The Golem of Prague, 12"x 16", Oil on Paper on Masonite, 2013. Back in August, at Gen Con Indy, I was approached by a man who was starting a book called "Lands and Legends". It is a book of illustrations based on various myths, legends and fantastic places, from all cultures around the world. I was saying yes to his pitch in no time. There was already a huge list of amazing illustrators involved and he had a great financial plan for this book that would involve a Kickstarter campaign. He had a list of ideas for various subjects that would meet his criteria, as I glossed over the list, "The Golem of Prague" jumped out at me and my mind was made up that this was my subject matter. The Golem has been a subject I have wanted to paint since I came back from Prague four years ago. I went to a service in the Old New Synagogue (depicted in the background of the painting) with my Wife and Father-In-Law, knowing full well that what was left of the Golem was still living in the attic above me. This was a tough challenge, I had to depict this story in a way which would not come off as Anti-Semitic to the casual viewer. 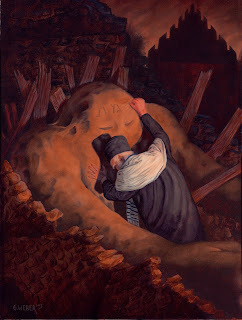 The story is, Rabbi Loew created this Golem to protect his Jewish community from the Christians who were accusing and killing them due to a rumor that the Jews were committing Blood Libel. This was a completely false accusation, but Christians were killing Jews nonetheless. Eventually, after saving many people, the Golem stops working properly and it goes on a warpath. The Rabbi turns the Golem off by rubbing one of the letters off it's forehead, changing the phrase from "Truth" to "Death". I didn't want to show Christians as being the victims of an awful monster gone haywire, so I came up with a more delicate moment, when the Rabbi turns his creation off, ending his relationship with a being he treated like a child. I hope this came out looking true to the story, and interesting as a composition.